Fiji, $10, 1993. 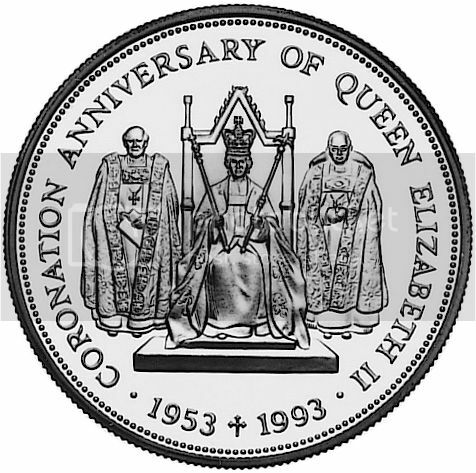 40th anniversary of the coronation of Queen Elizabeth II. Design by Avril Vaughan. Saint Helena and Ascension, 2 pounds, 1993. 40th anniversary of the Queen's coronation. Design by Norman Sillman. Came upon the denarius by chance and remembered the obol (pic borrowed from Wildwinds). They were even more similar in my memory. Still, they are quite similar. 1. Denarius of the Roman republic, 46 BC, signed T.CARISIVS. An upper and lower mounted die, the upper die garlanded, with tongs (maybe for handling hot flans) to the right and a (minting) hammer to the left. 2. Obol in the name of Louis the Pious (ruler 814-840) from METALLVM (Melle). An upper and lower mounted die, between (minting) hammers. There are 900 years between these coins and people were still counting in oboli and denarii. Finland, 5 euro, 2014. Black-throated loon. Sudan, 10 pounds, 1978. Organization of African Unity Summit, Khartoum. This comes in a set of 5 and 10 pounds (silver) and 25 and 50 pounds (gold). Sierra Leone, 1 leone and 10 leones, 1980. Organization of African Unity Summit, Freetown. Note the difference in the number of islands on these maps. From top to bottom, Sudan shows five, five, three, three and four islands. From top to bottom, Sierra Leone shows six and five islands - all in the north west and nothing down by Madagascar. The question now is, can you name the islands that these dots represent? Bahamas, $10, 1998. 50th anniversary of the University of the West Indies. 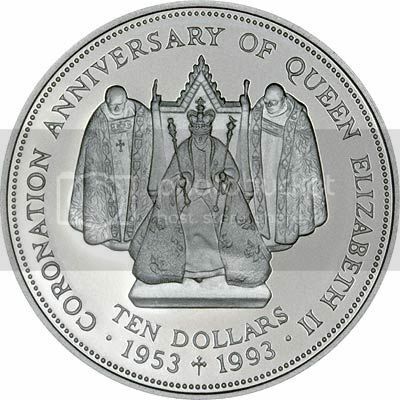 Belize, $10, 1998. 50th anniversary of the University of the West Indies. East Caribbean States, $10, 1998. 50th anniversary of the University of the West Indies. Jamaica, $50, 1998. 50th anniversary of the University of the West Indies. The university coat of arms was modelled by Robert Elderton. Jamaica, $10, 1980. Tenth Anniversary of the Caribbean Development Bank. Jamaica, $1, 1981. World Food Day Commemorative. East Caribbean Territories, $10, 1980. East Caribbean States, 2000 cents, Year 2000. Design by Robert Elderton. The two designs are far from being closely similar. However, they do contain similar pictorial elements. I wonder whether Robert Elderton had seen the Liberian design at some time and it stuck in his memory. Whether he consciously or subconsciously remembered or referenced the Liberian design is something we cannot know.